Married Name Her married name was Hinrichs. Maria Gade married Fritz J. Hinrichs. Married Name 14 July 1918 As of 14 July 1918,her married name was Frommung. Martha Luehrsen was born circa 1894. She was the daughter of Edward C. Luehrsen and Emilie Schuette. Martha Luehrsen married Martin Frommung on 14 July 1918 at St John Lutheran Church, Reedsburg, Sauk, Wisconsin. Martin Frommung was born circa 1888. He married Martha Luehrsen, daughter of Edward C. Luehrsen and Emilie Schuette, on 14 July 1918 at St John Lutheran Church, Reedsburg, Sauk, Wisconsin. Married Name 26 May 1920 As of 26 May 1920,her married name was Cooper. Verona Buelow was born circa 1895. She married Cyril R. Cooper, son of George William Cooper and Mildred Bull, on 26 May 1920 at St John Lutheran Church, Reedsburg, Sauk, Wisconsin. Married Name 8 September 1920 As of 8 September 1920,her married name was Leicher. Elizabeth Fischer was born circa 1885. She married Gilbert C. Leicher, son of Fenton A. Leicher and Anna Krug, on 8 September 1920 at St John Lutheran Church, Reedsburg, Sauk, Wisconsin. Married Name before 1925 As of before 1925,her married name was Lawsha. Married Name 30 September 1925 As of 30 September 1925,her married name was Stahnke. Flora Gardner was born circa 1876. She married (?) Lawsha before 1925. Flora Gardner married William John Stahnke, son of Carl F. Stahnke and Fredricke Malitzke, on 30 September 1925 at St John Lutheran Church, Reedsburg, Sauk, Wisconsin. (?) Lawsha died before 1925. He married Flora Gardner before 1925. Married Name 14 June 1934 As of 14 June 1934,her married name was Farber. Lydia Westfahl was born circa 1913. She married Raymond Walter Farber, son of Julius Henry Farber and Dorothea Catherine Schuette, on 14 June 1934 at St John Lutheran Church, Reedsburg, Sauk, Wisconsin. Name Variation Henry C. Mueller was also known as Moeller. Henry C. Mueller was born on 14 September 1899 at Monee, Will, Illinois. He was the son of (?) Mueller and unknown (?). Henry C. Mueller died in January 1975 at age 75 Henry C Mueller obituary. Name Variation Albert Mueller was also known as Moeller. Albert Mueller was the son of (?) Mueller and unknown (?). Albert Mueller died after 1980. Name Variation Lena Mueller was also known as Moeller. Married Name Her married name was Stolzenbach. Lena Mueller married Edgar Stolzenbach. Lena Mueller was born circa 1903. She was the daughter of (?) Mueller and unknown (?). Lena Mueller died on 25 June 1957 Lena (Moeller) Stolzenbach obituary. Edgar Stolzenbach married Lena Mueller, daughter of (?) Mueller and unknown (?). Unknown (?) married (?) Mueller. Lillian (?) married Martin Mueller, son of (?) Mueller and unknown (?). Lillian (?) died after 1980. Irvin H. Termuende was the son of (?) Termuende. Irvin H. Termuende married Irma Mueller, daughter of Martin Mueller and Lillian (? ), in September 1965. Donald Mueller was the son of Martin Mueller and Lillian (?). Donald Mueller died after 1980. Delmar Mueller was the son of Martin Mueller and Lillian (?). Delmar Mueller was an usher at the wedding of Irvin H. Termuende and Irma Mueller in September 1965. Delmar Mueller died after 1980. Gerald Mueller was the son of Martin Mueller and Lillian (?). Gerald Mueller died after 1980. Russell Mueller was the son of Martin Mueller and Lillian (?). Russell Mueller was an usher at the wedding of Irvin H. Termuende and Irma Mueller in September 1965. Russell Mueller died after 1980. Johann Conrad Grages was born in 1792. Johann Conrad Grages died in 1811. Anne Marie Dorothea Grages was born in 1796. She was the daughter of Carl Heinrich Grages and Maria Ilse Dorothea Freyse. Anne Marie Dorothea Grages died in 1800. Johann Juergen Heinrich Grages was born in 1799. Anne Ilse Marie Dorothee Grages was born in 1799. Married Name 23 February 1786 As of 23 February 1786,her married name was Grages. 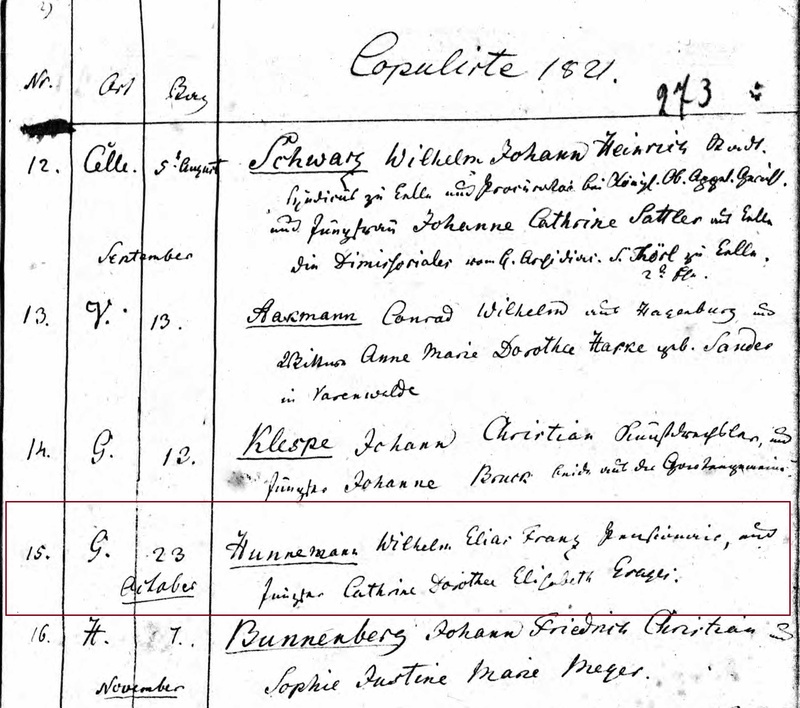 Dorothea Sophie Meyers married Carl Heinrich Grages, son of Jurgen Johann Grages and Margarete Bahren, on 23 February 1786 at Bokeloh, Wunstorf, Germany. Dorothea Sophie Meyers died before 1791. Heinrich Johann Ernst Grages married Caroline Begemann. Heinrich Johann Ernst Grages was born on 19 October 1786 at Bokeloh 5, Wunstorf, Neustadt, Hannover, Germany. He was the son of Carl Heinrich Grages and Dorothea Sophie Meyers. Name Variation Catharina Dorothea Elisabeth Grages was also known as Gragei. Name Variation Catharina Dorothea Elisabeth Grages was also known as Katharine Dorothee. Name Variation Catharina Dorothea Elisabeth Grages was also known as Dorothee. Married Name 23 September 1821 As of 23 September 1821,her married name was Hunnemann. Catharina Dorothea Elisabeth Grages was born in 1788 also reported as circa 1794. She was the daughter of Carl Heinrich Grages and Dorothea Sophie Meyers. [S401] Marriages, and Burials Germany Lutheran Baptisms Digital Archives, by Ancestry.com. He was the son of Georg Friedrich Hunnemann and Johanne Sophie Catharine Hennigs. Married Name 3 March 1800 As of 3 March 1800,her married name was Grages. 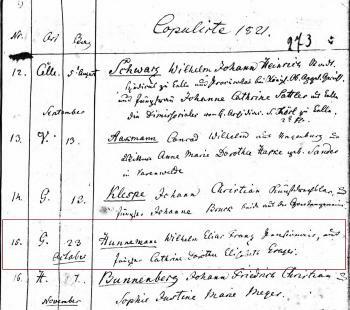 Engel Marie Bolten married Carl Heinrich Grages, son of Jurgen Johann Grages and Margarete Bahren, on 3 March 1800. Engel Marie Bolten died before 1810. Engel Marie Dorothee Grages was born in 1800. She was the daughter of Carl Heinrich Grages and Engel Marie Bolten.